Issues of representation are central to Collishaw’s work, which includes photography, installation, sculpture and film. By making transparent the means of construction or contrasting unlikely material, his work succeeds at attracting and then distancing the viewer, subtly involving them in a mode of deception. ‘Waterfall’ demonstrates these ideas. 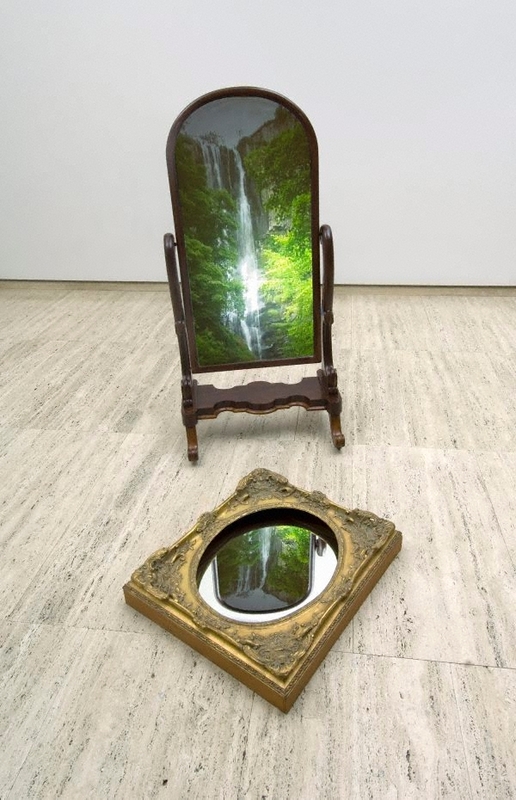 The work includes a video image of a picturesque waterfall projected onto an antique cheval mirror, which in turn reflects downward to an old gilt-framed mirror resting on the floor and filled with rippling water. In the projected image, the movement of the falling water is barely discernable. Synthetic cascades of water descend metaphorically into real water, emphasising the chasm between what we believe and what we know to be there. The effect is meant to be inscrutable; a barrier to looking which influences perception and understanding, establishing a space between impression and actuality. A similar dialectic is achieved by combining recent technology and old-fashioned furniture. The cheval mirror and gilt frame reference a past era, while the video image is a contemporary element that situates the work in a present timeframe. This engenders an abstract exchange between past and present accentuating the work’s pretence. Combining pre-existing and artificial elements, ‘Waterfall’ deals with a recurring theme in Collishaw’s work: the rapport between nature and culture. In elucidating how nature is framed by cultural constructs, ‘Waterfall’ represents Collishaw’s inquiry into processes of looking, revealing his ability to surreptitiously invent slippages in comprehension.